Wikipedia says the name Lysol comes from a combination of the words “lysosome” and “solvent” but it also says lysosomes weren’t discovered until 1949 (??) It is a modification of carbolic acid used by Dr. Lister to clean up surgical and gynecological procedures (i.e., surgeons, whose unwashed hands, frock coats, and instruments spread contaminating organisms between women giving birth). I still have this image in my head of buckets of milky water being splashed down cobblestone city streets in Camus’ The Plague or Mann’s Death in Venice in order to prevent epidemics. 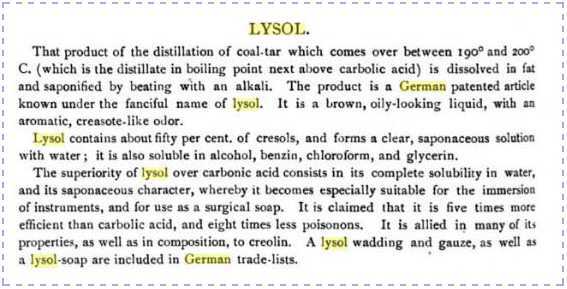 Lysol the consumer product is also an interesting access point to early 20th century advertising and cultural concepts of women and women’s role and the cultural meaning of “health”. Through time, the Lysol and Dettol brands have changed their compositions. Lysol in particular has had its name appended to other types of disinfectants (the “quats” or quaternary compounds). Today it is difficult to find out about brown-bottle Lysol. In the USA it cannot be listed as a disinfectant because it has not been submitted to the Environmental Protection Agency for testing. The taxidermists and the museum/library conservationists have noted the changes in Lysol (substitutes of different phenolic compounds, addition of alcohols, a change in proportion of ingredients and the switch to the quaternary Lysol) which evidently affect how the material cleans or instead dissolves skin and any attached hair or feathers. …the word detergent has tended to imply synthetic detergent, or syndet for short, rather than the older soap. In fact, commercial formulations consist of a number of components, and we shall use the term surface-active agent, or it’s abbreviation surfactant, to describe the special active ingredients that give detergents their unusual properties. Soap, by this definition, is a surfactant. In fact, it is the oldest one and has been in use for over 4500 years. The surfactant industry is a huge and dynamic business, and soap is just the start… Most familiar of all surfactants is soap, a simple substance which, in water, clearly demonstrates two effects. It produces foam due to its action at the air-water interface, and it makes the grease transfer from grubby hands into the soapy water as a result of its activity at the water-oil (grease) interface…. Soap was, and still is, made by the alkaline hydrolysis of animal fats or vegetable oils – a process known as saponification. Moving on from soaps – and into the 19th century – the next surfactants to be developed were the sulphates and sulphonates of vegetable oils. The reaction of castor oil with sulphuric acid is a classic example from the late 1800s. In this reaction the product is a mixture of sulphates and sulphonates which, after neutralisation with sodium hydroxide, give a product known as Turkey Red oil useful in the dyeing of linen. We’re talking about the oil from the castor bean plant, which isn’t a bean at all, [ Ricinus communis] and not the castor which comes from glands in the beaver mammal, Castor canadensis, once used for perfumes. Bill Casselman has an excellent disentanglement of “castor” and a photo of the nasty plant. Older Americans know of castor oil as a laxative or a “spring tonic” given to children. Look through the historical British Journal of Medicine for obsolete uses of castor oil and its soap for treatments during pregnancy. Fortunately, less harsh remedies are now available. Castor oil is not poisonous if carefully separated from the water soluble components of the castor seed. Castor bean plants are sometimes used as an ornamental plant. In New Zealand, the neighbor behind me had an overgrown lot of immense castor plants, just a mess. The “beans” themselves are highly poisonous. Sometimes the seeds end up as beads for necklaces. The ingredient in Sarin gas (used in the Tokyo underground killings) is ricin which is derived from the plant. Castor oil is a “light” oil. Unfortunately, I don’t know the chemistry behind this. 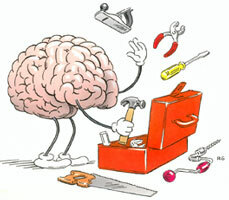 It does lead to interesting properties of the oil (see the Wikipedia article). I believe it may have been used once for oil immersion lenses in microscopy because of its purity, light refracting ability, and temperature range stability. It is less likely than some other oils to get “gummy” over time or with heat. The castor oil can be made into a liquid soap. I ran across some 1911 data testing soap as an insecticide. Soaps will dissolve proteins or fats which form the coatings or walls of some microorganisms and will disrupt some insect coatings. Generally, the soap is not the germicide, the phenol compound is. I don’t know for sure, but I believe the soap may aid in maintaining the antiseptic cresol or phenol in solution. The Castor Oil Resource http://www.castoroil.in This is a comprehensive portal. This article also includes a description of How surfactants work and I think provides a key to why castor oil soap for Dettol / Lysol, micelles. There are two disinfectants in Listerine, alcohol and cinnamon. This is why Listerine and similar mouthwashes are effective against “bad breath germs” but also the bacteria causing cavities (caries). Alcohol we’ve discussed before. The disinfection power of cinnamon can be demonstrated by making bread for cinnamon toast. Prior to bread machines, cinnamon bread was a layer of cinnamon sugar butter and raisins rolled up in the dough and not mixed in the dough ingredients. I like cinnamon toast and figured I could make a cinnamony loaf in my bread machine. I added several teaspoons to the dry ingredients and pushed the button. The result? A blob of cooked stuff in the bottom of the bread pan. The cinnamon had killed the yeast. ** Dr Mike Thompson, Winchester College, UK, Molecule of the Month description and illustrations, mentioned in the earlier post, is an excellent beginning. Lysol contains phenol (40-55%) cresol (3%) and water (the rest) It does not contain o-phenol phenol. 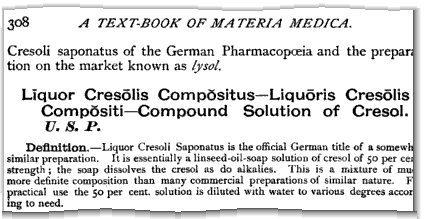 For those of you unfamiliar with Cresol I gather that it is a fraction of coal tar, and is a phenolic type product…. It does look to me and the technical chemist whom I obtained this information from as though there may well be differences between the product we know as “Lysol” here in Europe and the one known to you and produced by Reckit and Coleman Inc in the States. Dilutable liquid cleaner / deodorizer. The Germans had an advanced coal-tar industry. A Text-book of materia medica, therapeutics and pharmacology By George Frank Butler Published 1908. Saunders. The makers of Lysol disinfectant have agreed to stop asserting that using the product around the house will kill germs that cause flu, colds or sore throat, the Federal Trade Commission announced today. There’s no further info available without purchasing the article. This is rather curious but may explain why brown-bottle Lysol is not EPA labelled. Anyone know the story? “Schulke & Mayr was founded in 1889 by the Hamburg businessmen Rudolf Schulke and Julius Mayr for the sale of the first packaged branded preparation for disinfection: LYSOL. I am submitting to your goodself a lot-more thanks along with X’mas Greetings.I have done 2 samplings of Dettol – Equivalent Antiseptic Liquid using Castor OIL Soap-35% along with PCMX and that I experienced SUCCESS in getting the Milky White Cloudy emergence when pouring a Teaspoon full Liquid Antiseptic in to a BOWL of water. Environmental Health Division, the FBI, and other public health and law enforcement agencies to investigate a case of possible ricin exposure in Las Vegas. Preliminary results of environmental testing at laboratories in Nevada have tested positive for ricin. Ricin is a potent biologic toxin that is derived from castor beans.